On Memorial Day we remember the brave men and women who gave their lives for us so that citizens of the United States of America can have access to freedom. 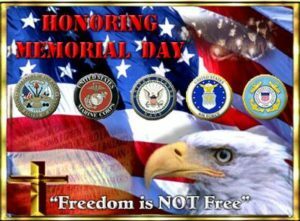 Celebrate the lives of the courageous individuals who sacrificed their lives for citizens of the United States. Remember the fallen men and women soldiers and pray for their families. Remember and pray for our missing in action soldiers. Remember prisoners of war. Pray for their deliverance and their families. Remember our wounded soldiers. Pray for their physical, mental and emotional healing and to receive the proper benefits in a timely manner. Pray for families as they travel and gather together to celebrate-Pray for traveling mercies, safety, joy and love. Remember soldiers who may not have received the honor due to them. 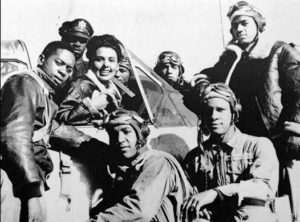 The picture reflects Lena Horne with a group of Tuskegee Airmen on January 1, 1945. There are countless photos of Ms. Horne visiting Tuskegee Airmen and other military personnel to show her support for their service. She also showed her support for them by refusing to perform for segregated military audiences during World War II. Being offended is an experience not unique to any of us. We’ve all been there, but few are honest about the price we pay to hang out at this “non-luxury” location. Let’s call it Maximus Offense Hotel. It’s very costly to stay there and the only amenities are hurt, anger, regret, feelings of exclusion, bitterness and revenge. Most places we have traveled or spent time at were introduced to us through someone we know. Perhaps a parent, school teacher, friend, colleague, or simply perusing through a travel magazine and having that special place catch your eye. Introduction to the Maximus Offense Hotel can be just as varied. Once there, it’s easy to renew that reservation over and over and over unless one refuse to pay the high cost and understands that almost anywhere is better than hanging out there. As I began to write this article, the question arose in my mind, “when was the first time in my life that I can look back and say I was offended? As you are reading this article, it might be helpful to reflect to the time that you were first offended. The first I remember anyway, was when I was 19 or 20 years of age. Surely I’d experienced disappointment before then, but this one sticks out as the one I truly never forgot. Some members of my family were talking with great excitement about going to Mastoris Restaurant in Bordentown, NJ. No one bothered to invite me. They spoke as if I wasn’t even listening. Desiring to be included, I decided I’d just invite myself, so I did. The response was one of a tolerant “yes” rather than the enthusiastic “we’d love to have you join us” that I was anticipating. Off we went and boy was it a worthy introduction to the Maximus Offense Hotel. Going forward from that day, I felt with this group of family members that the same exclusion they showed me that day, would become their modus operandi regarding me. Was this deliberate, or did I attract the behavior they had shown me based on my own failed expectations of them and my flawed depiction of myself? I’ve learned in life that by example, you teach people not only how to treat you, but also mirror the perception you have of yourself to them. It’s non-coincidental that certain people are seemingly always offended and others aren’t. Anyone come to mind? Is it you? Lord have mercy! Like the song “say my name, say my name” are you at this moment thinking of a name? I like Oxford Dictionaries’ definition: “annoyance or resentment brought about by a perceived insult to or disregard for oneself or one’s standards or principles” If I had to pull one word from this definition to sum up how one feels when there is an offense, it would be DISREGARD. Every offense has a measure of one believing (whether true or not) that his/her feelings, character, importance, or worth as been disregarded. Truth and or reason don’t ride shotgun in the vehicle of Offense they are out of sight and out of mind. The front seat passenger is accusation and the driver is deception. Have you been in offense? Are you parked there right at this moment? Great! There is deliverance for us all and I mean once and for all, as we realize like never before, who the real culprit is. It’s not your relative, your co-workers, and definitely not your spouse. It’s the one that God’s word says is the GIVE UP THE RESENTMENT “accuser of the brethren” Revelation 12:10 – And I heard a loud voice saying in heaven, Now is come salvation, and strength, and the kingdom of our God, and the power of his Christ: for the accuser of our brethren is cast down, which accused them before our God day and night. Satan makes accusations and as Believers we are to cover wrongs done to us with love, and to forgive. DOES A WRONG DONE JUSTIFY OFFENSE? Wow,. Holding on to offense and resentment is too heavy a weight for any of us to carry. Here are a few steps to take toward forgiveness and annihilating offense. Is this easy? No way. Is it possible? Absolutely! Don’t rehearse it by talking about it, confession bring possession good or evil. Offense can sometimes be linked to jealousy, which we’ll discuss at another time. King Saul was in offense the same as many people today experience it. Offense takes your eyes off the gifts, value and relevance of your worth and who you are. You than focus only on what someone else has and the superiority to yourself, that you perceive they have. Saul had great strength, ability, knowledge, wealth and purpose. Nevertheless, once he got into offense over David’s success and favor with God he stopped valuing his own worth and began to see David as his enemy. David on the other hand humble and secure, refused to retaliate even when he knew Saul was seeking his life at every hand. Offense sets a person up to become their own worst enemy and eventually to self-destruct. Saul wasted the rest of his life basically trying to get rid of David. Saints and sinners alike know that someone else’s failure doesn’t guarantee the offended person’s success. Bernice earned her degree in Mental Health/Social Work from Oakland Community College in MI and studied Social Work at Marygrove College in Det., MI. She is a graduate of Word of Faith, ICC’s School of Ministry, and was ordained by Bishop Keith A. Butler. Bernice now serves as an Elder at Wake Chapel Church, Raleigh, NC under Bishop J. Jasper Wilkins. She authored “The Perfect Blend” and “Can We Talk” a blended family workbook. prayed for us,nurtured us, defended us, trained us, chastised us, “whipped us”, stood by us, prayed for us continuously, travailed for us., sacrificed for us and Loved us….. 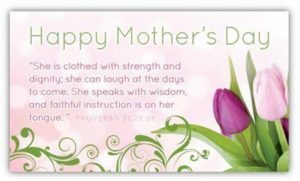 Thank you Mother, “Ma”,”Mama”, “Ma Dear”, Grandmother, Grandma, “Aunti”, “Miss Sue”, Mrs. Smith…………… etc……..
For Your Great Name’s Sake ! 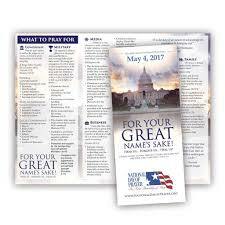 The National Day of Prayer, May 4, 2017 theme this year is For Your Great Name’s Sake! Hear Us… Forgive Us…Heal Us! Taken from Daniel 9:19, which says, “O Lord, Listen! O Lord, Forgive! O Lord, Hear and Act! For Your Sake, O My God…”. Scripture tells us again and again that our fervent prayer is effective. Our loving God responds to His children’s earnest pleas in mighty ways that avail much, and ultimately determine the course of history. At this crucial time for our nation, we can do nothing more important than pray. Let us pray corporately and individually over our families, government etc so that we can glorify God and heal the land and our families. Let us not take it for granted for the freedom to call out loud and worship the Lord freely. The National Day of prayer focus is Government, Church, Military, Family, Education, Media, and Business. God is in control of this nation. Let us not take for granted this day of prayer, designated by Congress, signed into law by the President of the United States. Former President Obama signed the same when he was the leader of our nation as well as other Presidents. We should be praising and praying to the Lord for this nation every day in light of the freedom we enjoy and the present evils we observe that threaten the peace of our nation and the community. The apostle Paul urged that “requests, prayers, intercession and thanksgiving be made for everyone…that we may live peaceful and quiet lives in all godliness and holiness. (I Timothy 2:1-3). It is time for us to P. R. A. Y. as a nation corporately and individually. 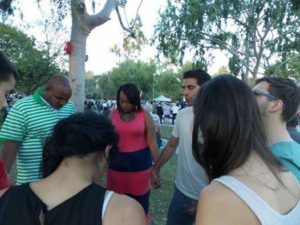 In this turbulent time of open racism, rumors of wars and aggression, and troubled communities and cites we need to go before the Lord to seek through prayer, “peaceful and quiet lives” – for ourselves, our families, our neighbors and friends and our nation. • Pray for unity and love in family units that reaches out in hospitality toward others. Romans 12:9-13. • Pray for God centered relationships among family members. • Pray that parents will be bold to instruct their children in God’s way of living and lead their families to pray together. 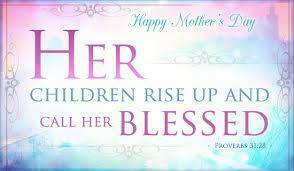 • Pray for relationships between parents and children that it be one of love, respect, honor and obedience. • Pray for a return to the biblical mandate to train children at home. • Pray for our youth –their safety, protection, obedience, purpose and excellence. 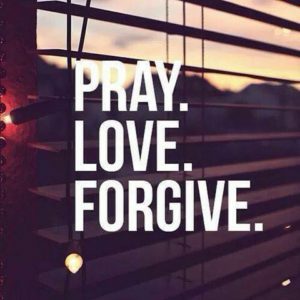 .• Pray that Christ forgiveness would dissolve anger, bitterness and strife in relationships among family members. • Pray for the family and for elected leaders and the members of our judicial system as they consider proposed legislation and various court cases related to marriage and the family to preserve what God intended. • Pray for righteousness to prevail in this nation. Righteousness exalts a nation Proverbs 14:34. • Pray for our leaders, as well as the judges in our courts. Ask God to grant them wisdom to act with integrity.1 Timothy 2:1-2. • Pray that leaders will be granted divine wisdom, guidance and strength to fulfill their important roles; leaders to make wise decisions. • Pray for righteous judges and judgments in every court (Isaiah 1:26). • Pray that business women and men of integrity, fairness and courage will arise .May God bless those who base business practices in righteousness. • Pray that God will raise up His ambassadors in the workplace that will have influence. • Pray for the economy, that new companies will come to the region. • Pray for sound and fair businesses, for favor, new contracts, witty ideas and creativity and for solutions to problems to help the community. • Pray for the workplace- for fairness and fair pay and to be free of harassment and prejudice. May God frustrate plans and practices which escalate injustice. Pray for discernment and protection from the of the United States’ enemies that are among us, even as others plot against us from afar. Pray for safety, morally sound instruction and wholesome environments.